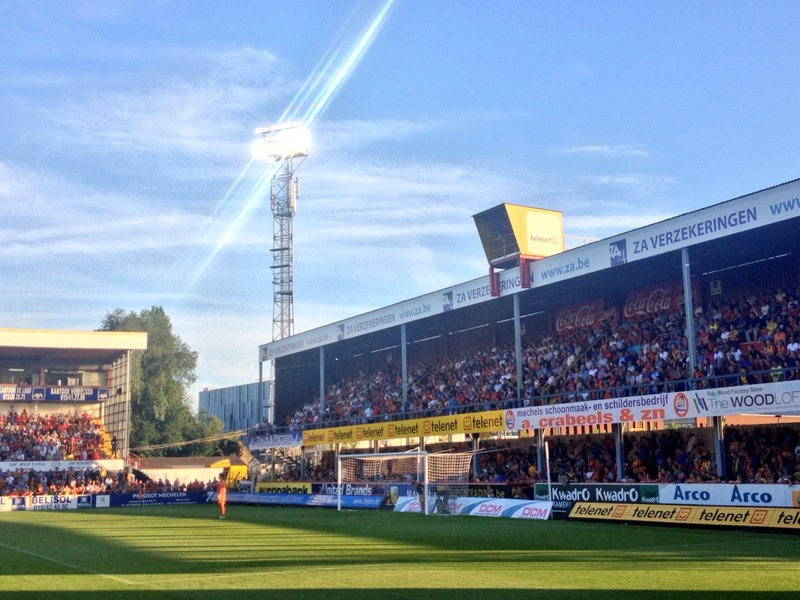 After a short ride from the wondrous time had at Lyra, we found ourselves in good time for the evening kick-off at K.V.Mechelen. To our delight both the Belgian Cup and the first round of Jupiler Pro League fixtures had thrown up several options for a double and K.V. more than fitted the bill. Tickets ordered in advance online were collected effortlessly from the super efficient kiosk. 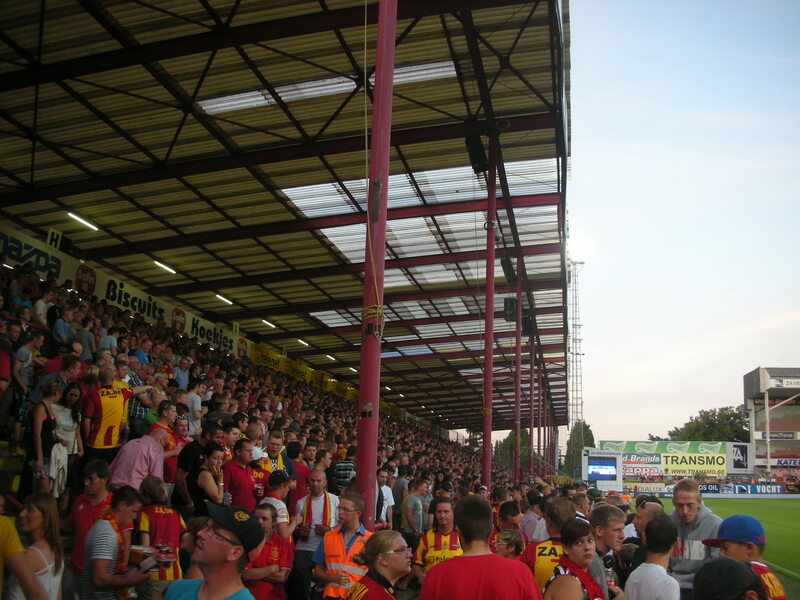 To give the hosts their full name for once, Yellow Red Koninklijke Voetbalclub Mechelen, would explain the vibrant coloured queues waiting for the gates to swing open at 7pm. 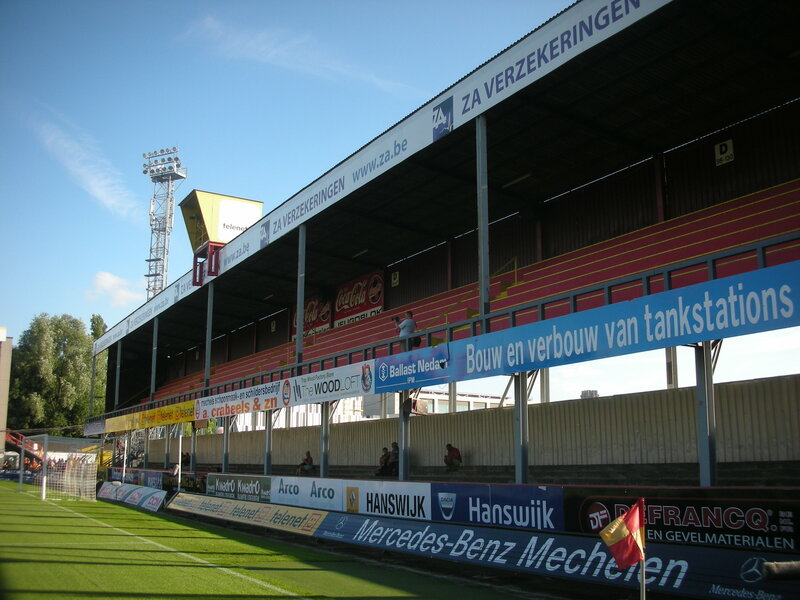 Formed in 1904 a mere couple of months after city neighbours Racing Mechelen, KV have a proud history and rejoice in the low matricule number of 25. 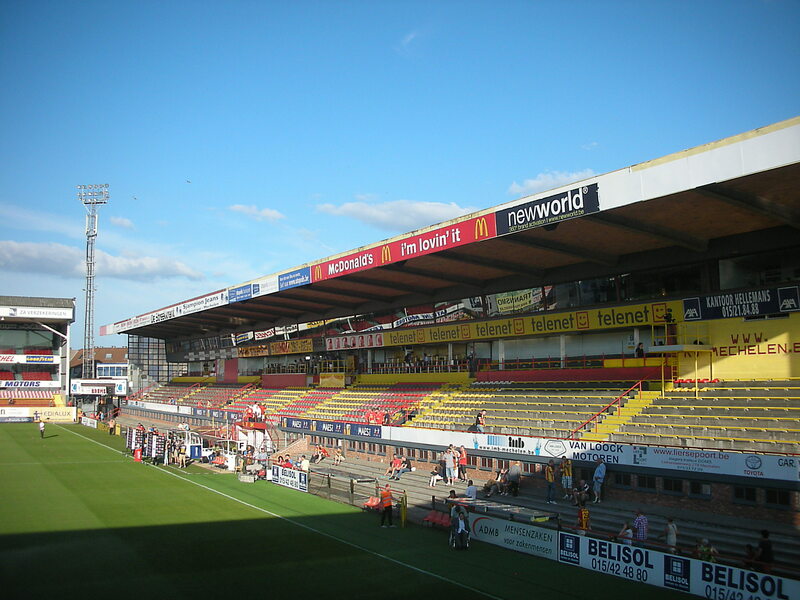 Today’s opposition, Standard de Liège, however, are older still and own matricule 16. The clubs home ground has the dreaded sponsored name of Argosstadion after Argos Oil paid for the naming rights. Its traditional name is Achter de Kazerne, which literally translated as “behind the barracks”, the ground having once been adjacent to a large but now demolished army base. The club has played at Achter since 1911 when the then president Francis Dessain purchased the vacant land from the Chevalier Marin brewery. The club were originally called FC Malinois and the supporters are often still referred to as “Malinwa”. The ground itself is quite magnificent. The main grandstand has wooden seating and an unusual slated roof, opposite is a really traditional covered terrace, a large percentage of the 10,402 crowd will gather here. The fans that stand on this side of the ground generate a really first class atmosphere of singing, colour and noise. 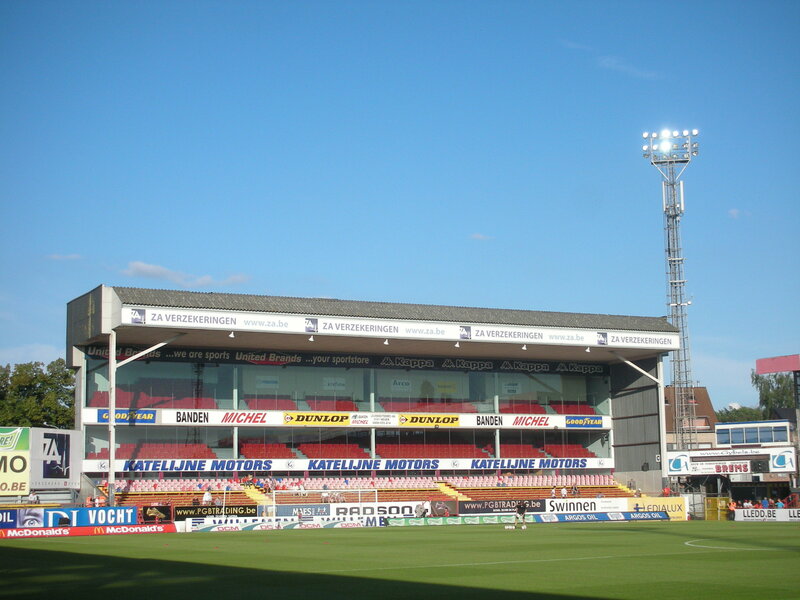 Behind the far goal is an unusual twin tier stand with benched seating in the top tier and terracing underneath. The other end looks formidable from the outside, tall and cavernous but in truth the twin tier of glazed corporate seating, more than half empty for this opening match of the season, is a tad underwhelming once inside. 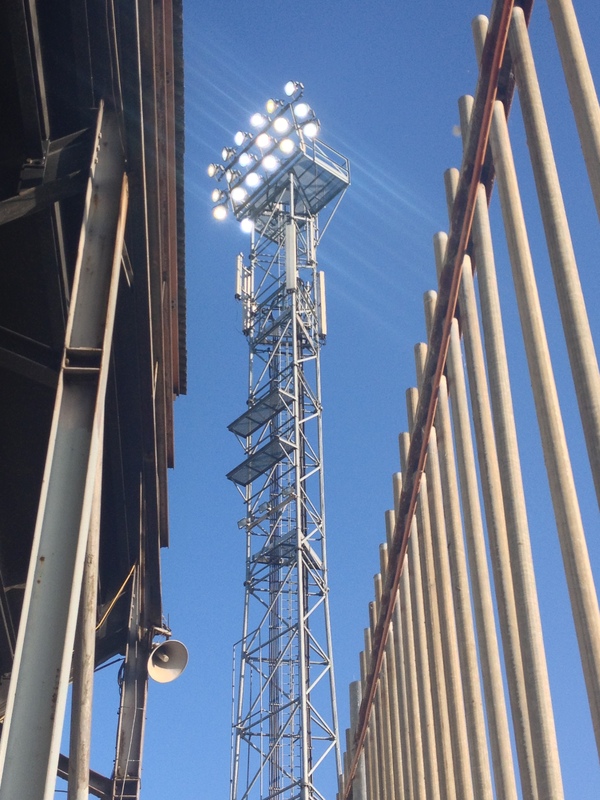 Aside from that minor quibble a stunning set of traditional floodlight pylons complete a really great ground that is draped liberally in the club’s colours of “Geel en Rood”. One does wonder whether the redevelopment of the huge covered terrace and the twin tier stand behind the goal at the end of this season will have a deleterious affect on the feel of the stadium. The club does need to progress so lets hope the plans are sympathetic and in keeping with the great history of this venue. 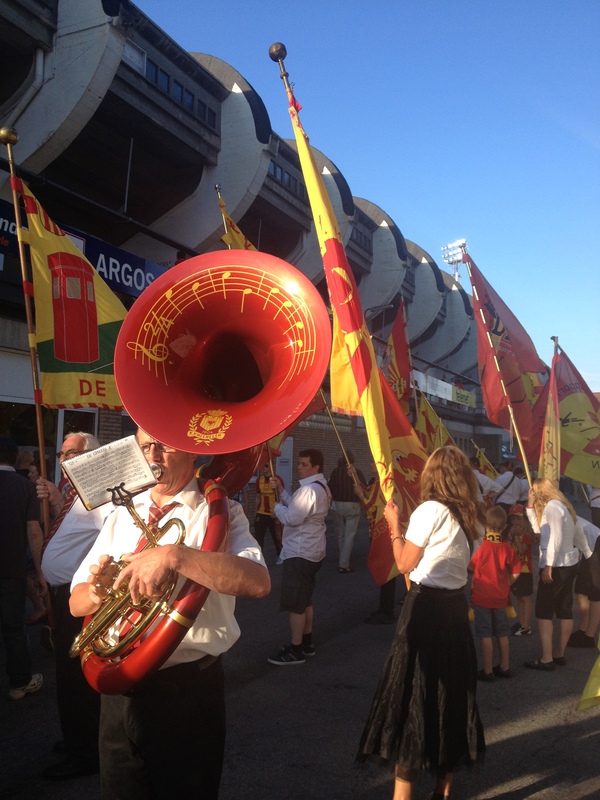 A brass band and anthem singing turn the volume up prior to the kick-off and expectation is high for the start of the new season. The home side toil manfully in the heat but seem to lack quality in the forward department. The visitors show their title credentials with two identical breakaway goals in the second half. In both cases a forward springs the offside trap from a counter attack and slots past the home custodian. On the quality of play alone they are worthy winners. Belgian football has some really historic old fashioned football grounds indeed the recently opened Ghelamco Arena in Gent is the first totally new stadium in the country in 38 years. Both K.V. 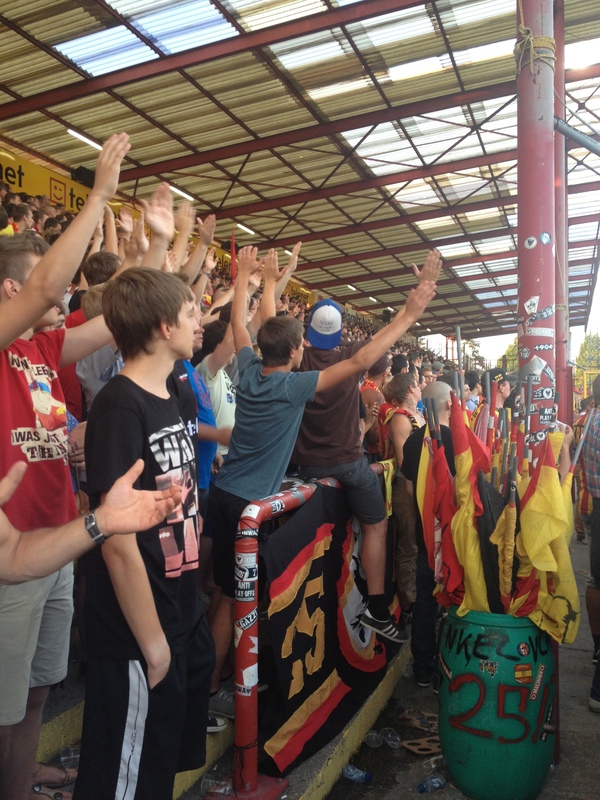 Mechelen and Lyra TSV were an absolute pleasure to visit and some more trips to this welcoming corner of Europe will certainly be pushed up the agenda. 1. Wouter Biebauw; 4. Seth De Witte; 6. Sheldon Bateau; 10. Abdul-Yakuni Iddi; 13. Wannes Van Tricht; 14. Benjamin Mokulu; 15. Thomas Enevoldsen; 19. Maxime Biset; 21. Anthony Van Loo; 26. Antonio Ghomsi; 29. Alessandro Cordaro. 28. Tome Pacovski; 3. Seweryn Michalski; 8. Jerry Vandam; 9. Mads Junker; 11. Mats Rits; 16. Victor Prodell (for 10, 67 mins); 18. David Destorme (for 13, 46 mins); 20. Joachim Van Damme (for 14, 78 mins). 1. Elji Kawashima; 4. Daniel Opare; 6. Laurent Ciman; 17. Yoni Buyens; 23. Michy Batshuayi; 25. Antonio Periera Dos Santos; 37. Jelle Van Damme; 39. Imoh Ezekiel; 40. Paul Jose Mpoku Ebunge; 44. Ibrahima Cisse; 63. Geoffrey Mujangibia. 16, Anthony Morris; 2. Alessandro Iandoli (for 40, 69 mins); 7. Raza Ghoochannejahad; 10. Igor De Camargo (for 39, 78 mins); 11. Frederic Bulot (for 63, 65 mins); 36. Dino Arslanagic; 75. Alpaslan Ozturk. 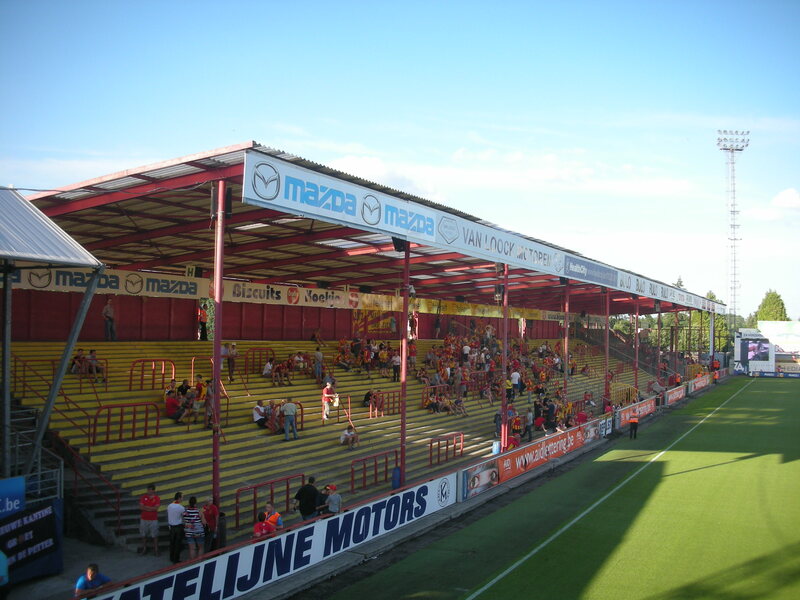 This entry was posted in Travel, Matches & Stadiums and tagged Achter de Kazerne, argosstadion, Belgian Football, Belgium, groundhopping, Jupiler Pro League, KV Mechelen, Standard Liege, Yellow and Reds by peterrmiles. Bookmark the permalink.